Calculation of security codes for immobilizer key programming and electronic unit synchronization, calculation of mechanical KEY codes by VIN, passwords for Coded Access to security functions of genuine OEM software and much more. Code Wizard Pro 2 is a powerful solution for real professionals. Despite the complex algorithms and sophisticated features CWP-2 is user friendly and easy to use. 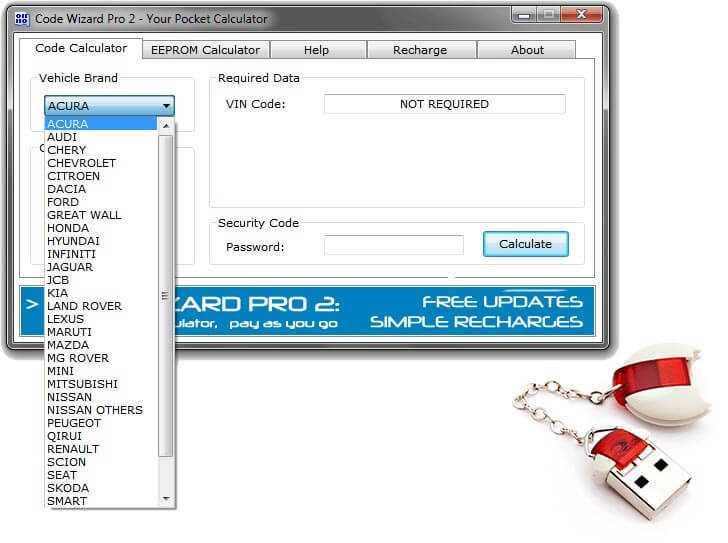 Code Wizard Pro 2 project developed to more sensible to the need of all types of users. It doesn’t matter how many calculations you are going to make. There are no limits for calculations at all. Every calculation has its own price, price is evaluated in number of tokens that you need to spend on any calculation. More than 50% of calculations are required ZERO tokens and maybe be available in DEMO mode. Tokens are available on our shop and you can order as many tokens as you think you might need for your calculations. That’s it. No more highly expensive updates, your Code Wizard Pro 2 software will be always up to date and ready. "0" - means what tokens will not be charged and this type of calculation may be available in DEMO mode. Tokens will not be charged for unsuccessfully calculations. Please double check data you entered before pressing "Calculate" button. For codes by dump please double check selected brand name and type of calculation. We recommend you to update software regularly, number of tokens required for calculations may be reduced. Initial release of DEMO version, you will find all information in “Help” tab of application. Welcome on board!